[map] [street view] [bird's eye] Due east of Corinth (and Farmington) in Mississippi, along County Road 200 (Farmington Road) just east of where it intersects County Road 177. 60 dBu protected contour map, from the FCC. [RDS] RDS decode on an Insignia HD portable radio. [Studio] WADI's studios as seen on Street View in downtown Iuka, Mississippi. They are co-located with non-comm WOWL. This station came on the air in the fall of 1968 or winter of '69 as WWTX, owned by Radio Corinth. From the beginning it, was a country station. The station was sold to E. C. Holford in 1975, and the call sign changed to the current WADI shortly thereafter. Channel Broadcasting acquired the station in 1978; they transferred the license to Joe Taylor Jobe in 1985. 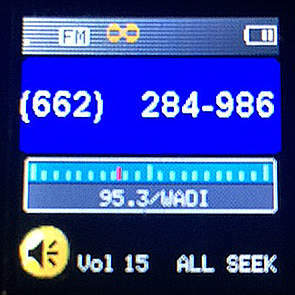 From 2002, the station ownership was under Power Valley Communications. The main guy at that company, Rick Biddle, also owned a non-commercial in the area, Burnsville's WOWL. Their studios were for years located in the same downtown Iuka building. Under Power Valley's ownership, the station was known as Supercountry 95.3, although at some point in the 2000s they changed the name to "95.3 The Bee", while keeping the same country music they've always had. Rick Biddle passed away in the spring of 2017 and in July of that year the station was bought by Eagle Radio Network, Inc. They have a stake in WBIP AM in Booneville, too. The station began simulcasting with WXWX Marietta, Mississippi on 30 April 2018.